Dividing a walled garden into equivalent quadrants is a natural geometric impulse, and the resulting four-square form appears in the garden history of most cultures. The 'Char Bagh' (meaning, literally, 'four gardens'), though of Persian origins, has become most closely associated with the Mughal empire, an Islamic dynasty that ruled between 1526 and 1858 in territories now divided among Pakistan, Afghanistan, Kashmir, and northern India. The beautiful image above is a leaf from a Mughal manuscript now in the collection of the British Museum, c. 1590. "And this Paradise is enclosed all about with a wall...and in the most high place of Paradise, even in the middle place, is a well that casteth out the four floods that run by divers lands. Of the which, the first is clept Pison, or Ganges, that is all one; and it runneth throughout Ind or Emlak, in the which river be many precious stones, and much of lignum aloes and much gravel of gold. And that other river is clept Nilus or Gison, that goeth by Ethiopia and after by Egypt. And that other is clept Tigris, that runneth by Assyria and by Armenia the great. And that other is clept Euphrates, that runneth also by Media and Armenia and by Persia. And men there beyond say, that all the sweet waters of the world, above and beneath, take their beginning of the well of Paradise, and out of that well all waters come and go." 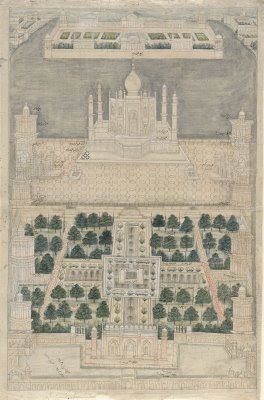 In an arid climate the ideal of heaven as a well-watered and verdant oasis was of special importance, and the quadrants of the Char Bagh are most often divided by canals (if large) or rills (if small) representing those four rivers of Paradise. The quadrants themselves are generally, but not always, symmetrical, and may be filled with loose, informal plantings that sometimes take on additional symbolic significance--cypresses for death, almond trees for life. 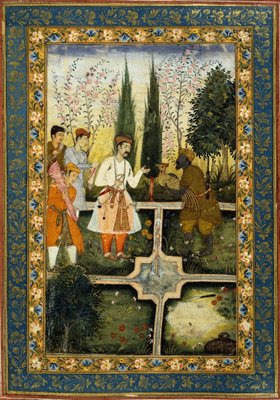 Mughal gardens have been the object of much scholarly research in recent years, being (arguably) the most active area of garden history research during the 1990s, and resulting in an excellent website on the subject at the Smithsonian. 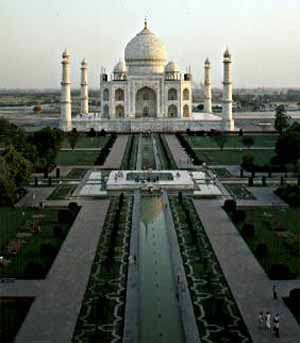 Very interesting, and as for the Garden History - BRAVO! Thanks! There are moments when I think of our personal garden as a paradise. More often, though, visiting well designed and maintained public gardens are high points in a gardener's life. It's interesting that quadrants have such a stabilizing, and yet artistic impact on design. with Levittown in Long Island and Pennsylvania, USA, or is it something more global? on seed research at Rutgers U. To get a green useless lush lawn? The American Lawn, Georges Teyssot, Princeton Architectural Press, 1999. I might point out that most interventions in the landscape, can be criticized as being too 'costly' in some sense, and that this lies largely in the eye of the beholder. Some see in the tradition of the American lawn an idealistic celebration of public open space. As a historian, I seek not so much to pass judgment as to understand.